Your furry friend's wrinkles give him or her a very distinctive appearance, but the very characteristic that helps define his or her breed can also cause skin irritation and infections. In many cases, preventing problems is a simple as cleaning skin folds every day. What Dogs Are at Risk? Any breed that has wrinkles, such as English bulldogs, Pekingese, Shar Pei, pugs, Neopolitan Mastiffs, bloodhounds and bullmastiffs, have a greater risk of developing pyoderma. Dogs of any breed that develop wrinkles or folds as a result of a weight gain are also more likely to experience skin problems. How Can I Prevent Irritation and Infections? Within a few days of a bath, dirt and debris begins to build up in your pet's skin folds. Without regular cleaning, your dog can soon develop an irritation or infection. Daily cleaning is the simplest way to prevent uncomfortable or painful irritations and infections. 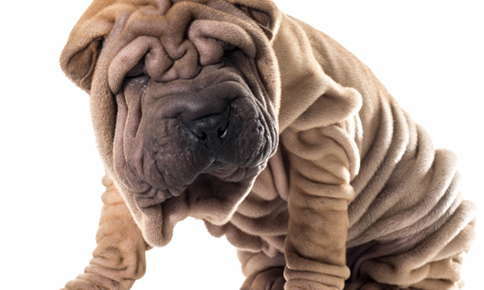 In some cases, you may want to clean your pet's folds and wrinkles more than once a day. For example, if food often gets trapped in the folds of your dog's face after meals, it may make sense to quickly clean the facial folds after every meal. Assemble the items you'll need for cleaning. Whether you use washcloths or cotton balls, or baby or canine wipes, you'll need soft, clean, moistened materials that won't irritate your pet's skin. There's no need to apply shampoo to the washcloth or cotton ball. As long as it's damp, it will pick up dirt easily. You'll also need a separate cloth to dry the folds. Lift every fold and gently swab away dirt and debris. Pay special attention to wrinkles around the ears and eyes. Infections in these areas can be particularly uncomfortable. If you use a washcloth, be sure to rinse it frequently to avoid adding debris to a fold, rather than removing it. Use your cloth to pat the fold dry. Failing to dry each fold may actually increase your dog's risk of a bacterial or fungal infection. Although using a hair dryer may offer a faster way to dry your pet, the hot, dry air can dry and irritate the skin. Before you use a dryer, even on a cool setting, check with your pet's veterinarian. Bathe your dog on a regular basis, making sure that each fold is examined and thoroughly cleaned. Use gentle shampoos that won't dry your furry friend's skin. What If My Dog Develops an Irritation or Infection Despite Daily Cleaning? A visit to the veterinarian is a good idea if your poor pet can't stop scratching or develops oozing sores or any other signs of an infection. If your dog does develop an infection, topical steroids may help reduce the itching or inflammation, while oral or topical antibiotics or fungicides will kill the bacteria or fungus responsible for the infection. Your pet's vet can also offer recommendations for bathing schedules and products that will help your dog avoid further infections or irritations. We can help your pet avoid uncomfortable skin issues with skincare suggestions and effective treatments. Contact us to schedule an appointment for your furry friend.